Probability factor: Mathematics and science professor at New York’s Courant Institute of Mathematical Sciences, Srinivasa Varadhan has just been named this year’s winner of the Abel Prize. If you googled “Srinivasa" plus “mathematics," the top result directs you to a web-page on Srinivasa Ramanujan, the world-renowned, self-taught Indian mathematician who died in 1920. The 67-year old bespectacled mathematics and science professor at New York’s Courant Institute of Mathematical Sciences has just been named this year’s winner of the Abel Prize, one of the most prestigious awards in mathematics. Awarded annually by the King of Norway, it is named after Norwegian mathematician Niels Henrik Abel, with the winner announced by the Norwegian Academy of Science and Letters based on a recommendation by a committee of five international mathematicians. The winner receives almost $1 million (Rs4.4 crore), similar to the Nobel Prize, which is awarded in Sweden and Norway and excludes mathematics. It is the “Nobel prize in mathematics," says Bhaumik Chattopadhyay, a mathematician at the Indian Institute of Technology in Delhi, though others consider the Fields Medal, an award given once every four years to a mathematician under 40 years, as the Nobel equivalent in their field. “Well, it’s a great honour, and that’s all that there is to it," says the rather soft-spoken Varadhan in a telephone conversation from New York. Easy for him to say though, having already won the George David Birkhoff Prize in applied mathematics and the American Mathematical Society’s Leroy Steele Prize. “He’s an extremely modest man," said Abhay Bhatt, a mathematics professor at the Indian Statistical Institute, New Delhi. He added that Varadhan was an excellent communicator, known for making effective and interesting presentations, even on abstract mathematical concepts. 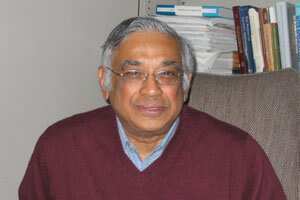 According to the Abel Prize citation, Varadhan was recognized for his fundamental contribution to the probability theory and developing a unified theory for large deviations. This theory helps mathematicians determine the probability of extremely rare events, such as the chances of a flash flood in a region that usually has predictable rainfall. “Generally, insurance firms are interested in such analyses," said Varadhan, before adding, “as it helps in deciding suitable premiums." These days though, Varadhan finds that real-life events don’t lend themselves too well to probability. “Well, there was no way I could predict the rare event of Bangladesh defeating India (in the first round of the ICC Cricket World Cup)," he says. “Lots of things are easier to predict than our team," he chuckles. Despite having left India some 44 years ago, Varadhan says remains extremely interested in cricket. Varadhan, who was born in Chennai and is called Raghu by those who know him well, joined Courant as a post-doctoral fellow in 1963 and three years later, at 26, published a seminal paper, titled Assymptotic probabilities and differential equations, working out a windowless room in what was once a hat factory. He went on to join the institute’s faculty and has seen his theory find applications in fields as diverse as quantum-field theory, statistical physics and creation of computer programmes that effectively simulate rare events. “I once heard that there are applications of it even at traffic signals," says Varadhan. Another important application of Varadhan’s theory is in climate modelling. The most baffling challenge that mathematicians face is trying to create weather models that predict extreme events. “Nobody has been successful yet," said K. Krishnakumarof the Indian Institute of Tropical Meteorology, “but Varadhan’s theories still push the best models we have today." Varadhan’s mathematical talents were evident from his days at the Indian Statistical Institute in Kolkata from where he got his Ph.D in 1963. His official biography on the Abel Prize’s website (www.abelprisen.no/en/) notes how his thesis advisor, the noted statistician C.R. Rao, had secretly invited famous Russian mathematician and probabilist A.N. Kolmogorovto sit in on the presentation being made by Varadhan. It was only after the exam, where he was asked many penetrating questions by Kolmogorov, that Rao let on as to who the visitor was. Now a long-time resident of New York, Varadhan is married to Vasundra, a professor at the New York University. They have one son, Ashok, having lost their eldest son, Gopal, in the 9/11 terrorist attacks on the World Trade Centre twin towers.